Abbot Kinney conceived and built Venice in 1904-1905 when the automobile was merely a rich man's toy rather than a means of transportation for the masses. He planned Venice with an adequate public mass transit system so there was little need for an extensive street network common in other non-canaled communities. But by the 1920's when the public was beginning to drive to Venice instead of commuting by electric trolley, it became obvious that more roads were needed with places to park cars. Progress was the word, and Venice's canals were an anachronism of the romantic past. The 1924 spring election brought to power an administration that seemed bent on self destruction. The Civic Betterment League's Trustees were committed to local government, rather than annexation to a neighboring city, only if public confidence could be restored to enable financing of a comprehensive series of civic improvements. However, one of their ideas of improving Venice in the name of progress was to build more roads. That meant paving the Pacific Electric's right of way on Trolley Way and filling in the canals. 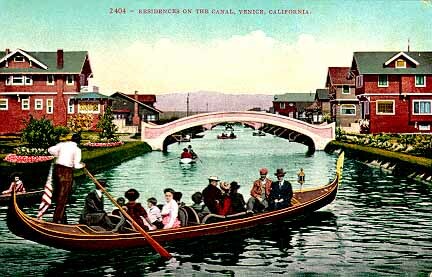 The Kinney family, discarding sentiment, cooperated by deeding all the canals north of Venice Boulevard to the city. It was an era when openings of newly paved roads and monthly records for new building permits made front page news. The Venice Vanguard newspaper editorials constantly advocated progress. The canal property owners were in an uproar. A public hearing to decide the fate of the canals, which had been scheduled before the Trustees voted, was declared a sham when public officials didn't show. At this point the canal owners, who had no recourse, went to court in an effort to prevent the transformation of the waterways into roadways. They argued that the project would result in a special assessment to their property and they would lose the park-like character of their district. The judge granted them a temporary injunction on August 6, 1924. Meanwhile Venice's city's government became more unmanageable and several annexation elections were held. The voters finally had enough and voted on October 2, 1925 to be annexed to Los Angeles. 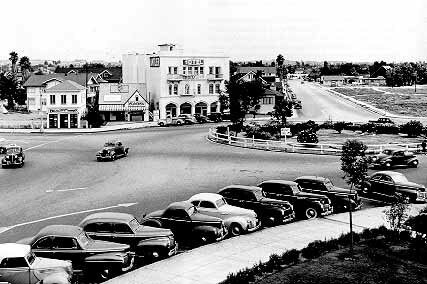 Venice became part of the city of Los Angeles on November 25, 1925. Venice's canal filling court case dragged on. When Judge Henry Hollzer of the California Supreme Court confirmed in December 1927 that the municipality had the power to fill in the canals, Thornton Kinney issued a statement. "Venice was a dream city and without sentiment it could not be built. But financial calculations suffocate sentiment and the march of time and progress of the community demanded sentiment be stifled." With the canals scheduled to be filled by the end of the year, it appeared to some people that Venice was finally modernizing. 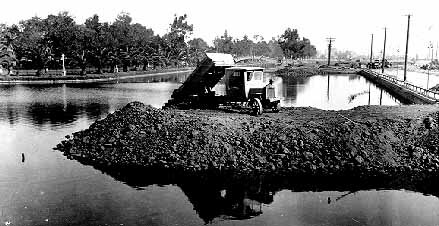 The Los Angeles City Council intended to proceed with the filling in of the canals during the summer of 1928. They legally changed the canal names to streets, then passed a canal fill order that was to be paid by an assessment to the area. They claimed that only 62 people out of 7500 property owners in the assessment district protested. On December 12, 1927 they awarded the canal fill contract to the R. A. Watson Company. Although the contract had been signed, the Board of Public Works refused to execute it in January 1928. Since the canals had been dedicated to the old city by Abbot Kinney, with the condition that they be used "solely and only for permanent waterways and canals free to the public forever", the board feared that if the canals were filled in they would revert to the Kinney heirs. Watson took his case to court because he wanted to proceed with the work without legal hindrance. A petition for writ of mandate was filed, but the District Court of Appeals refused it on Dec 18, 1928 on the grounds that the canals were dedicated to the city as waterways and they could not be legally used for any other purpose. With no recourse, the contractor took his case to the California Supreme Court, which ruled in the contractor's favor. Despite a gala three day canal filling celebration attended by Governor C.C. Young and five thousand residents, it was a dark day in Venice's history that summer of 1929 when the first trucks pulled up beside Coral Canal (now Main Street) to dump the first loads of dirt. It was almost directly in front of the postmaster's house that an angry crowd of over a hundred jumped into the drained canal and started shoveling the dirt out almost as fast as the contractor's crew could fill it in. Nonetheless work was completed before the end of the year at a cost of $636,205.85. Nearly 90,000 cubic yards of dirt was trucked in, rolled flat and covered by a seven inch layer of asphaltic concrete. The contractor installed a central drain basin and pumping plant beneath Kinney Plaza (the present Traffic Circle) sufficient to handle 9,160 feet of storm drains. Its five huge pumps were more than capable of handling the area's water runoff. The other canals south of Venice Boulevard remained. It was said that they were saved by the Depression and the contractor's bankruptcy. But in truth, the area, which was only half developed, wouldn't have supported an assessment. That and the lack of need for more roads saved the remaining canals.